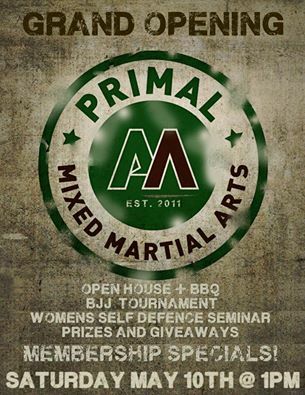 On May 10th 2014, we are proud to be hosting the official Grand Opening of Primal MMA Academy and the expansion of Primal Movement to include a lower level. We will now make up a 6000sq ft. comprehensive Mixed Martial Arts / Strength and Conditioning Facility. The day will include tours, women self defence seminar, 8 Men Blue Belt BJJ Tournament, Open Mat/Sparring along with food and drink. It doesn’t stop at 6 pm. 6+ we’re having BBQ upstairs in our Primal Movement gym and later we watch UFC on two big screens. Ping pong and Playstation are also at your disposal. Mark it in your calendars. This is not an event to be missed!